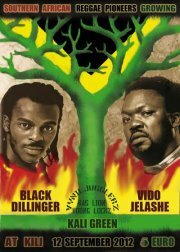 (eufrika) – The name says it all: It’s truely about Southern Africa Reggae Pioneers when Black Dillinger and Vido Jelashe will step up on Berlin’s Kili Club stage this Wednesday, September 12 (10pm). Might be, the two cousins from Captetown will take the crowd back to the Reggae Sound of the South Africa of the 80s and 90s, when the fight against the apartheid system inevitably became part of the country’s music scene. Although both artists were born in the township of Gugulethu and thus were introduced to the anti-apartheid struggle at an early age, they are now part of an international Reggae scene and have long expanded in topics and style. That said, you may well expect to experience an eclectic range of sounds from here and there between home and Berlin. Jelashe lives in Berlin since 2006 where he acts as one of the lead singers at dub crew Tiger Hifi. Also Black Dillinger, born as Nkululeko Madolo, shows up regularly in Germany’s capital to produce on the local label MKZWO Records which pushed his talent by signing him in 2006.